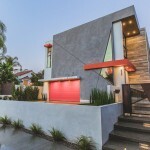 Los Angeles, California-based design/builder Steve Lazar’s recent project is a contemporary home he designed for his family in Manhattan Beach. 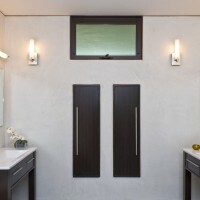 Manhattan Beach, California-based design/builder Steve Lazar’s recent project is a contemporary home he designed for his family in Manhattan Beach. 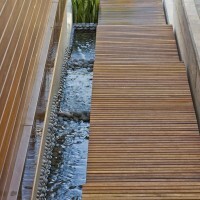 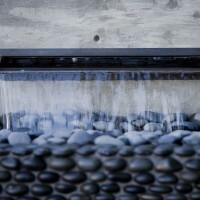 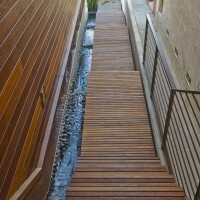 While ascending a series of Mangaris wood steps, one walks alongside a river of water flowing over riverbed stones that lead to the entrance of the home. 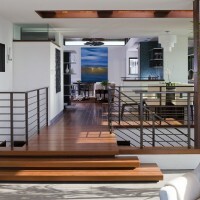 The entire three-story structure is comprised of stained and polished Mangaris wood, and the immediate impression is that the visitor has just arrived at an island resort. 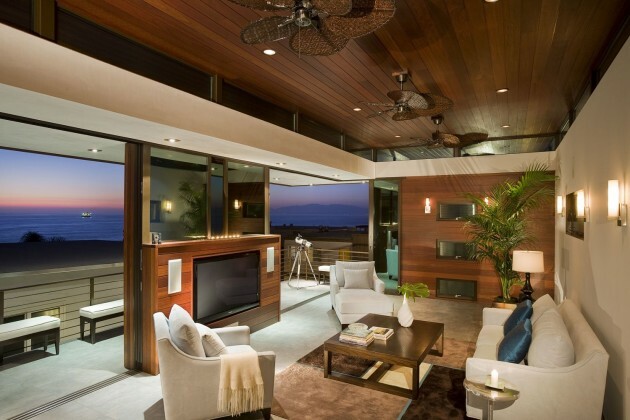 Inspiration from the islands is apparent throughout his design, as this home would be just as comfortable in Maui as it is in Manhattan Beach. 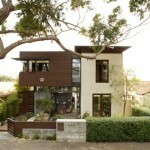 It is well poised to take advantage of coastal breezes from all direction. 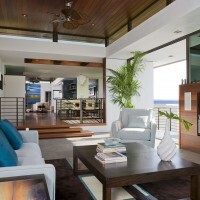 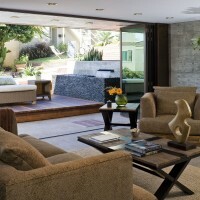 Stepping up to the living room, a panoramic view of the shoreline is visible through sliding-glass pocket doors. 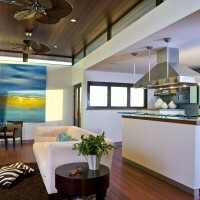 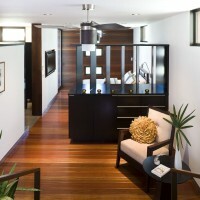 Contemporary furniture, spaciously placed, adorns the living spaces, creating a fresh, breathing environment. 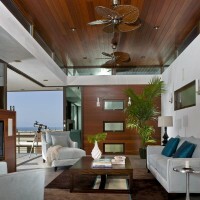 Accents of blue and green appear throughout the home, evoking the seaside surroundings. 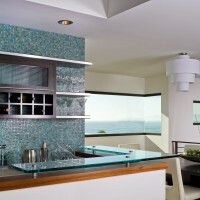 The spacious kitchen is comprised of stainless steel appliances with blue/green reflective mosaic tile. 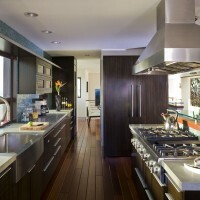 A dining room adjoins the kitchen area, and clean custom cabinetry with stainless steel finishes reveal more of Lazar’s attention to craftsmanship. 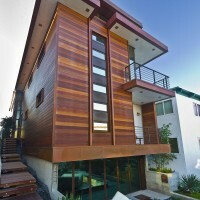 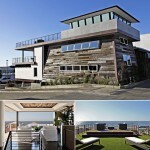 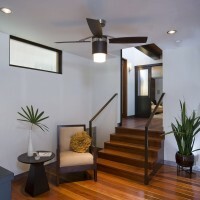 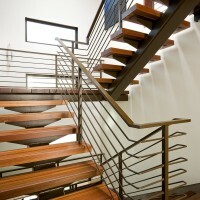 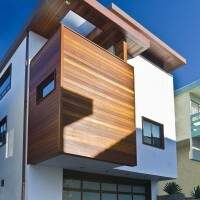 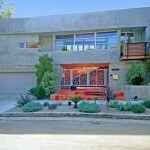 Visit the Lazar Design/Build website – here.